On the long list of reminders that you're getting older, realising that your former commute has become a site of historical interest must rank quite highly! 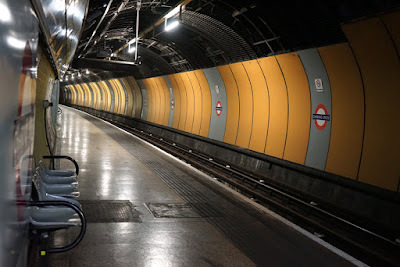 So it was slightly odd to visit the 'ghost platforms' of Charing Cross Underground Station. When the Jubilee Line was extended, it diverted from its former terminus at Charing Cross to new stations at Westminster and beyond. The now-disused tunnels and platforms were closed to passengers after twenty years - having opened in 1979, two years after the Queen's jubilee it was named for, the line gained its extension in 1999 just in time to take visitors to the Millennium Dome. Apt, since the 'Fleet Line' had originally been intended to serve south-east London when it was first proposed in 1965 (albeit on a different route via New Cross). Unlike the abandoned tunnels at Euston Station, these have lost their advertising. 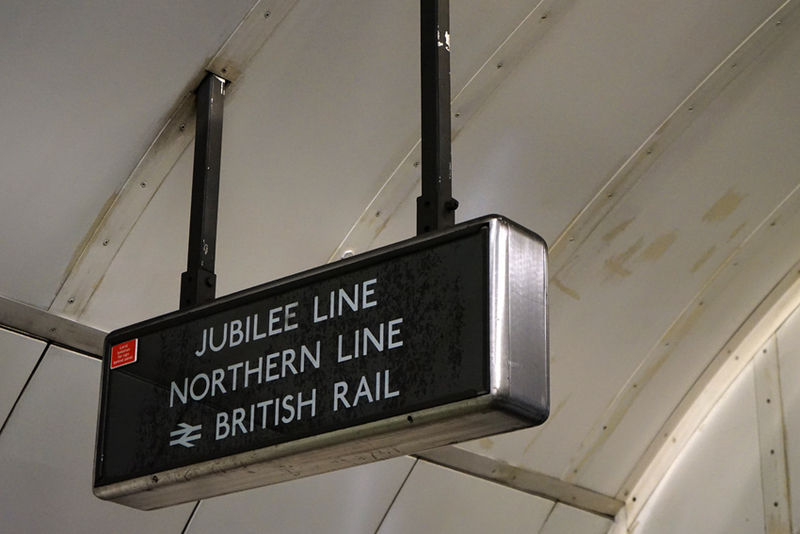 The 'British Rail' signage still strikes a period note, though. 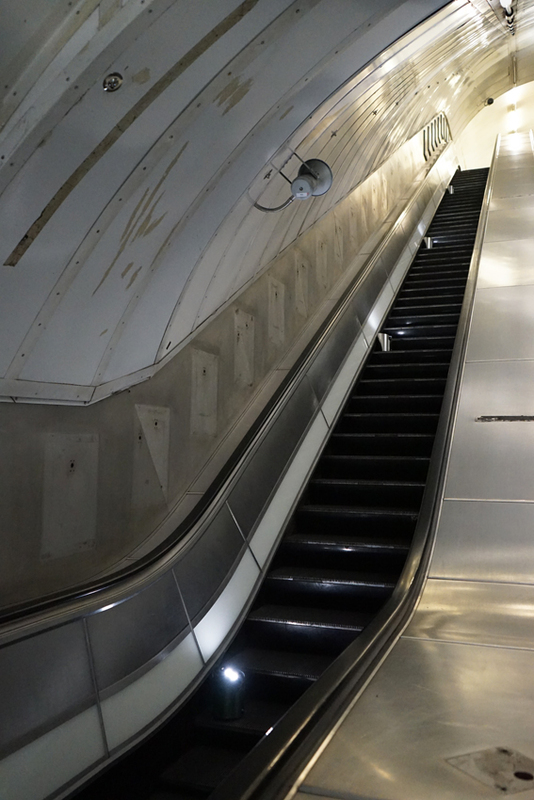 Commuters are notably absent, though, giving a post-apocalypic ambience. 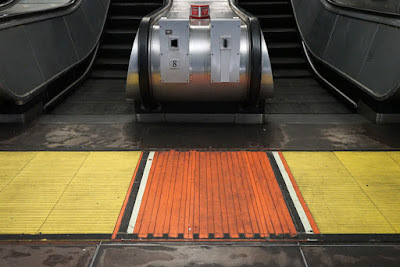 The platforms had been opened as part of the ICA's Art Night, a new festival held at the beginning of this month. Koo Jeong A, a Korean artist living in London, creates site-specific installations using smells and light: perfect for this location. 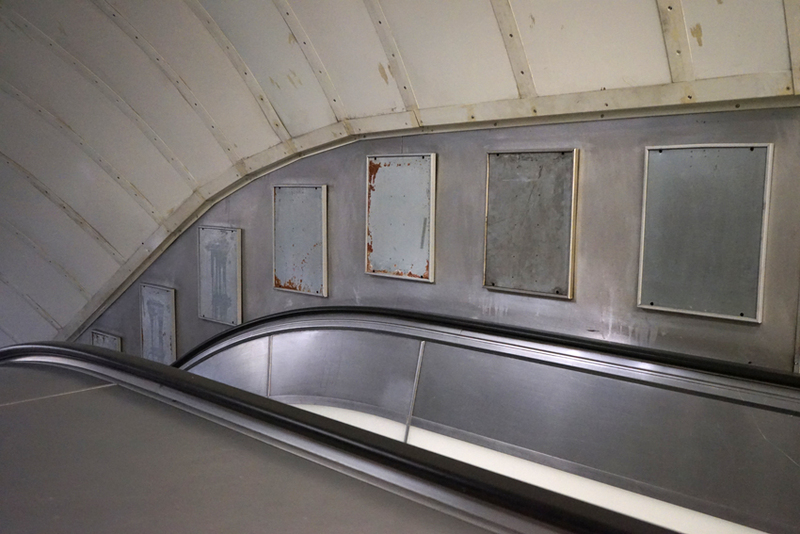 Other artists' work was showcased in empty brutalist buildings, Covent Garden market, and Admiralty Arch. With the ICA's selection of interesting venues to complement the art, this was an enjoyable evening: let's hope they hold it again next year. 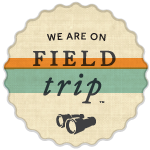 But which places would we put on our venue wish-list? 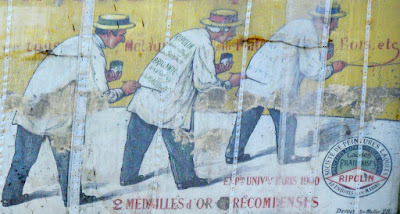 Ghost signs are relatively thin on the ground in Paris, but some of those which do survive are treated with real affection. When one for Cadum soap was lost, it was missed so much that the sign was later repainted. 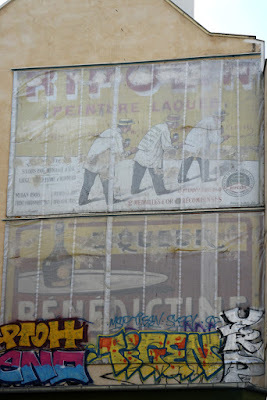 Even better is preserving the originals, and that is what has happened to these two, on the corner of rue des Martyrs and rue Hippolyte Lebas near Notre-Dame-de-Lorette. The signs were discovered in 2012, and a newspaper article (in French) tells the story of that discovery. 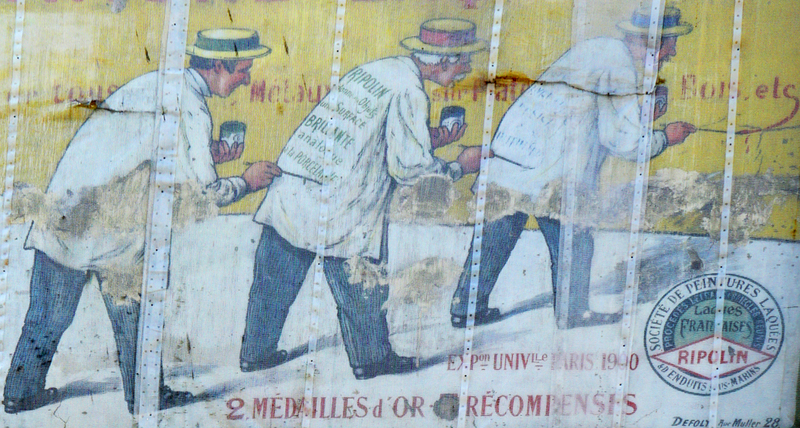 Renovating the facade, workers removed a wooden structure placed there in the 1930s and uncovered these remarkably well-preserved signs. Cartoonist Jul alerted the local authorities, and work was stopped. 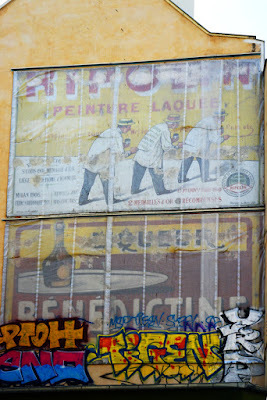 Over a century after the Ripolin advert was created by cartoonist and poster artist Emile Vavasseur, and the Benedictine advert by Defoly, the adverts have been designated a Monument Historique (listed, in effect) for their historical and artistic interest. 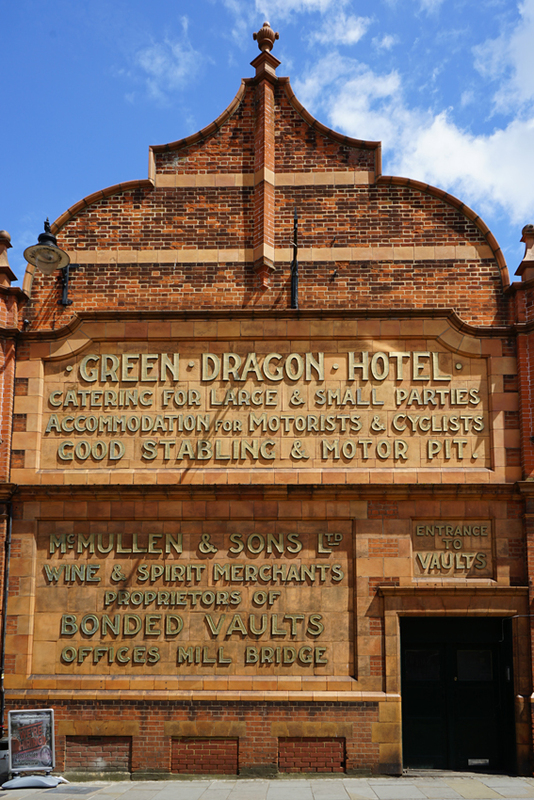 Tantalisingly, the listing text refers to a third sign which could not be preserved. Funds were being sought for restoration (a sometimes controversial option in Britain), which would cost several hundred thousand euros. 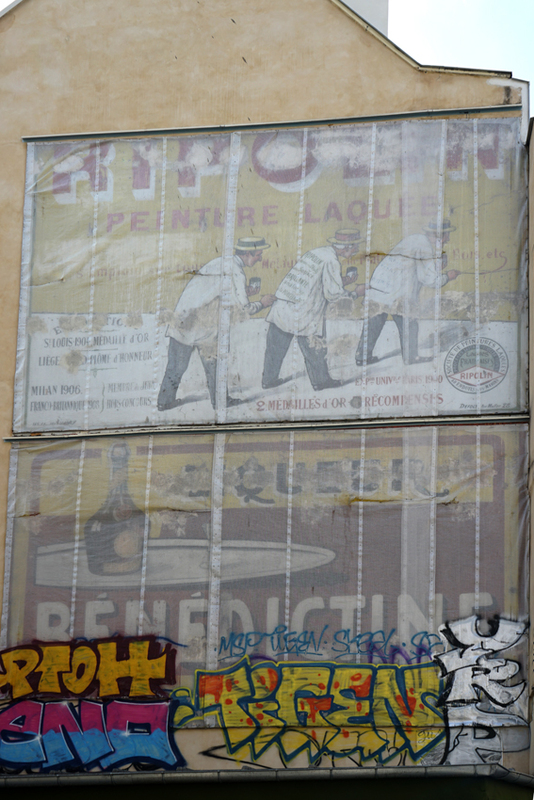 In the meantime, the painting is covered by clear sheeting. 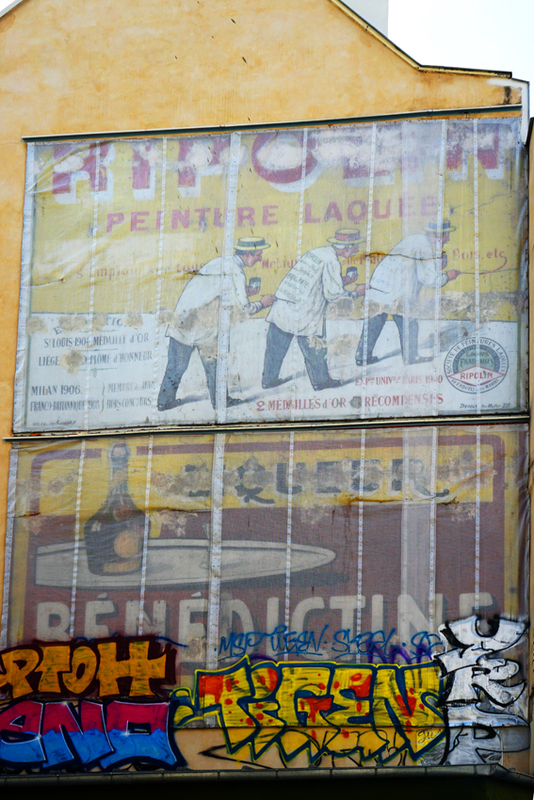 The covering may not be ideal - it rather obscures the signs - but it has saved them from graffiti as well as the weather. 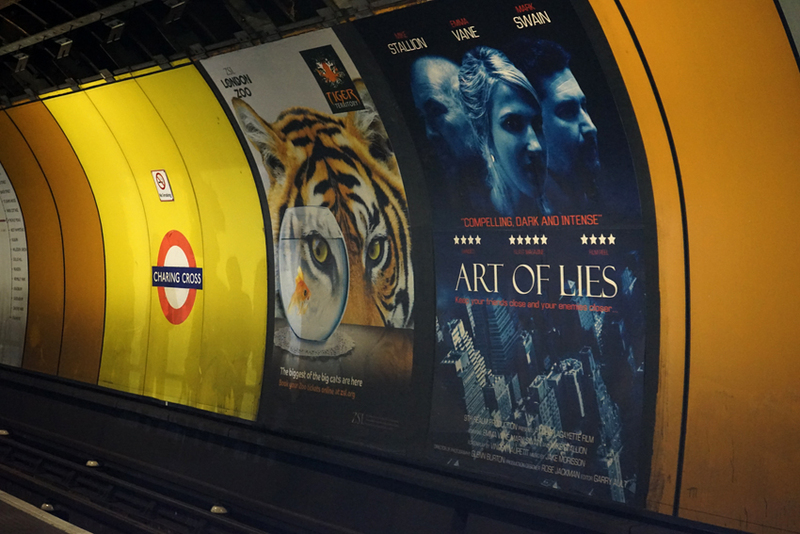 A little messing around in Photoshop allows us to see the painted images more clearly. As usual, click the images to enlarge them. 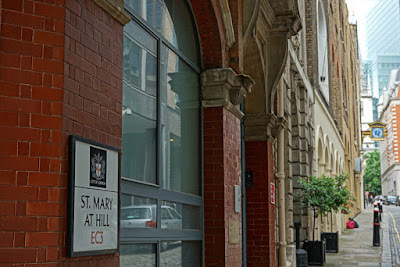 In the City of London, heading uphill from Old Billingsgate Market, is St Mary At Hill. It's not the best-known City street, and if you look at the east side, not the most interesting - modern buildings include a Premier Inn. 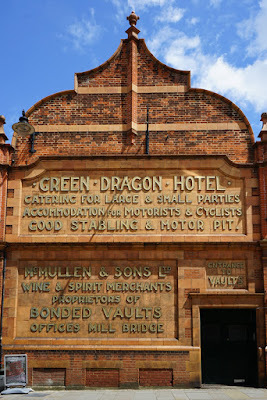 However, the left (west) side of the road is full of fascinating buildings. Right on the corner is a fine building bearing the words 'Reading Room & Library'. 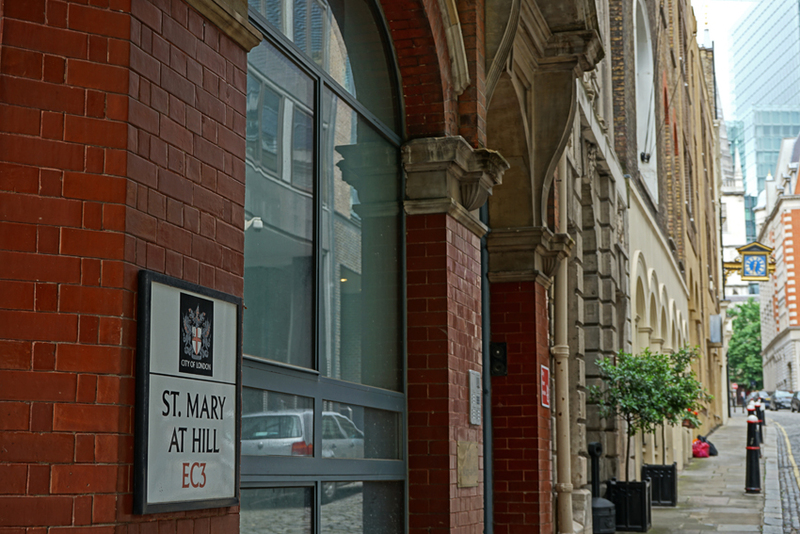 This is the former home of Billingsgate Christian Mission. 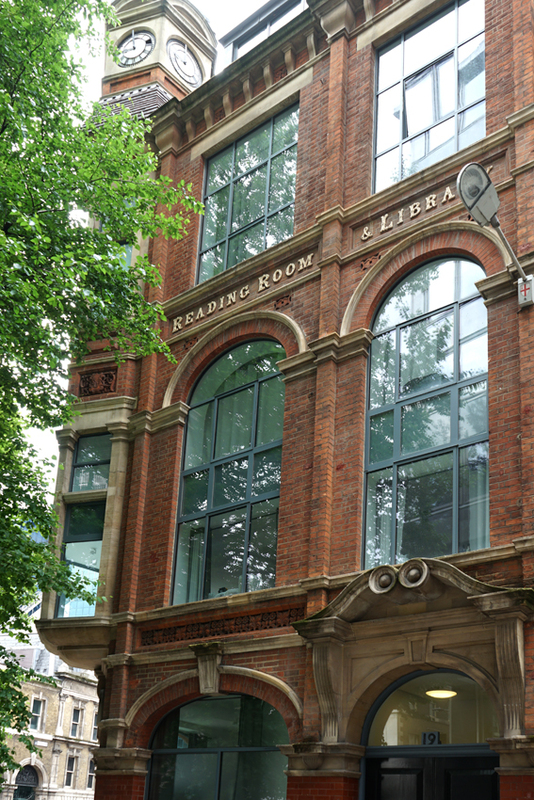 Built for them in 1889-90, it offered 'a well-chosen library of 1,000 volumes' as well as gospel services, a day refuge, temperance meetings and a coffee tavern. Seven years later, a dispensary was added to offer free first aid to market workers as well as train missionaries . In 1905, an ophthalmic ward was added, offering evening appointments between 6-8pm on Tuesdays so that poorer workers didn't have to lose pay to attend. 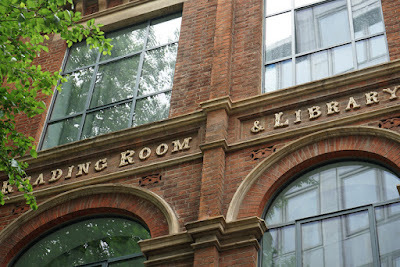 The organisation continued here for much of the twentieth century, although missionary training ended in the 1950s and much other work moved with the Billingsgate market to Docklands in 1982; it finally left this building in 1990. 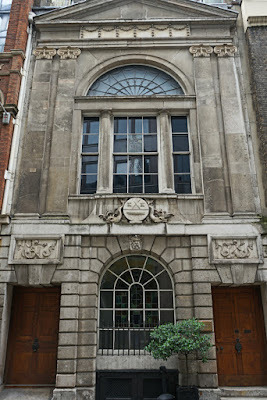 Trusteeship of the charity was taken over by the Fishmongers' Company. 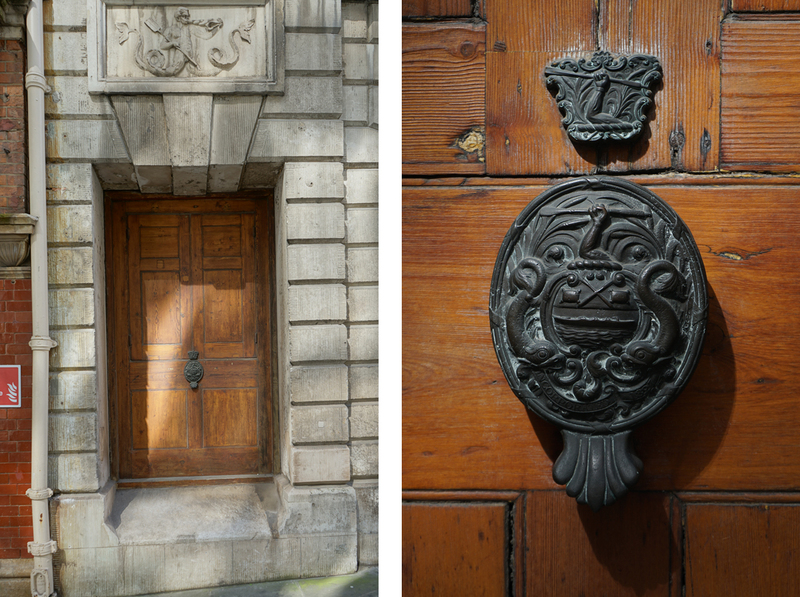 However, it's another City company whom we find next door in Watermen's Hall. The Company of Watermen was born in 1555, and since 1700 has represented both watermen (who carried passengers on the river) and lightermen (who carried cargo from ships to shore). It continues to facilitate an apprenticeship scheme, and those apprentices can compete in the annual Doggett's Coat and Badge Race for a red coat and silver badge. 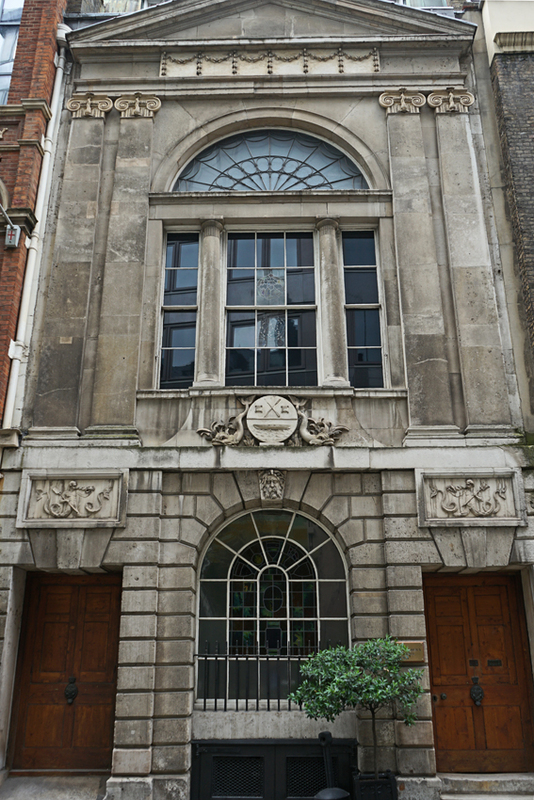 Founded by Thomas Doggett in 1715 to mark George I's accession to the throne, the single sculling race has been run by the Fishmongers' Company since 1722. 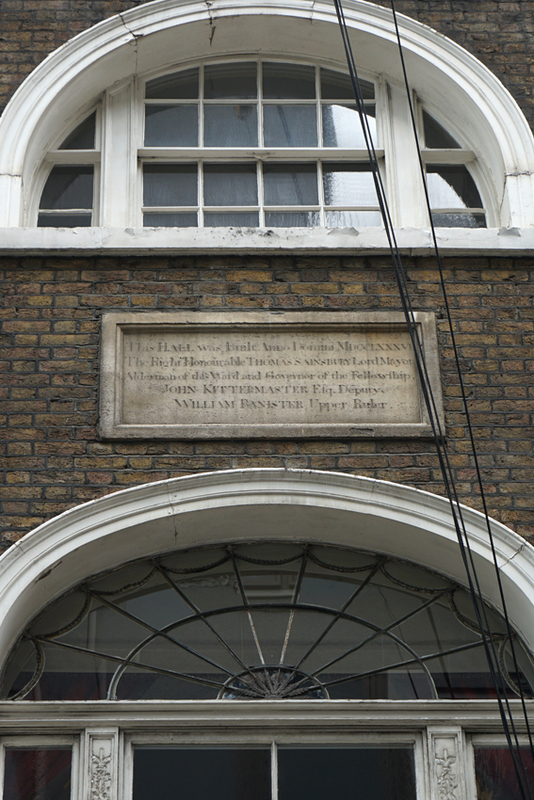 The prizes are awarded at Watermen's Hall, built in 1780.
by an act of common council, it was ordered that an annual sermon should be preached before them, in the parish church of St. Mary At Hill, the Sunday next after Midsummer Day; they, therefore, on the preceding night, furnish the merchants and respectable families in the neighbourhood with nosegays, and in the morning proceed from their hall to church, each having a large nosegay in his hand. On their arrival at the church, they walk up the middle aisle to the altar, and every porter deposits his benevolence for the use of the poor, and to defray the expenses of the day, into two basons provided for the purpose; and after having performed this ceremony, the deputy, merchants, with their wives, children, and servants, walk in order, from their separate pews, to perform the same solemnity. The nosegays used on this occasion are very expensive, and the custom is very antient. The Fellowship Porters seem to have had a strained relationship with the City of London which ended when they were disbanded in 1894. 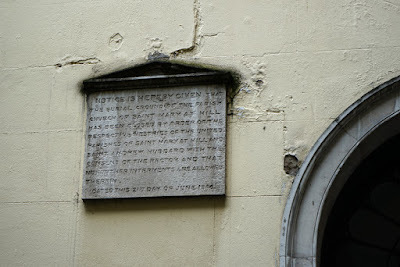 They had moved to Beer Lane by then; the Watermen bought the St Mary At Hill hall. We now come to the church of the same name, St-Mary-At-Hill - and although it's hard to miss the very fine clock, we don't see an entrance. 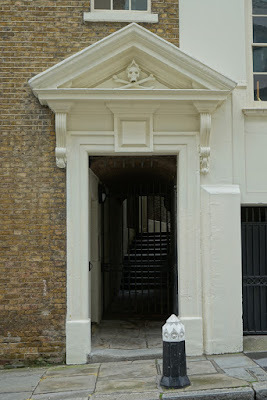 In fact, to reach it from this road you need to walk through a gateway, down a small passage, and into its courtyard. 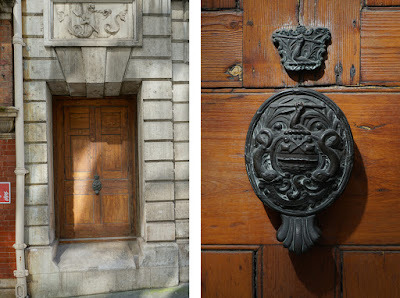 An alternative route begins the other side of the church, through an entrance marked with a skull and crossbones. 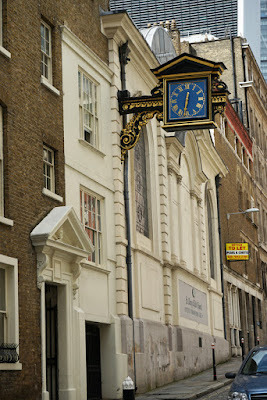 The church was rebuilt by Wren after suffering severe damage in the Great Fire of 1666, which started two streets away in Pudding Lane. Its courtyard was originally a graveyard. 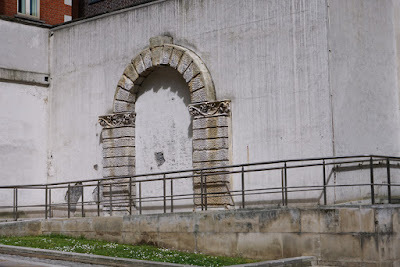 However, it was closed in 1846; the remains were moved to West Norwood Cemetery. A plaque informs us of the closure.This was part of a general movement to close the incredibly overcrowded, and consequently unsanitary and unpleasant, City burial grounds. Growth in the population meant a growth in the number of dead, and the need to bury them - and the temptation of bringing in burial fees - saw gravediggers disturbing or destroying earlier burials to fit new arrivals in. The early Victorians may not have understood bacteria, but they did believe that miasma - foul, stinking air - spread diseases, and many churchyards were shrouded in it. Eventually, new cemeteries were established at the edges of the city, with West Norwood opening in December 1837. The parish purchased its own plot in perpetuity within the new cemetery; sadly, it was subjected to a clearance in 1990 which was later challenged in Consistory Court. Before we leave the street, it's worth a quick glance at its east side: here, near the top of the road, is a rather isolated nineteenth-century archway set among the new buildings. Some famous London food inventions are shy about their origins: Scotch eggs come not from Scotland but from Fortnum & Mason, and more controversially, the Cornish pasty may also be the capital's creation. 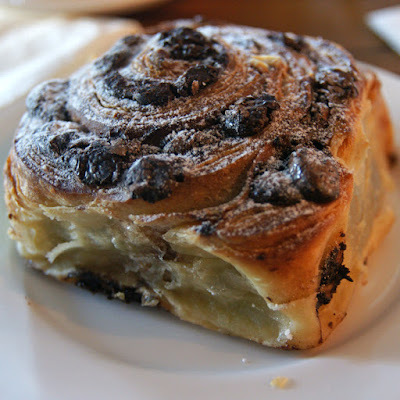 It's almost surprising, then, to know that Chelsea buns come from ... Chelsea. The buns are made of an egg-enriched yeast dough, spiced and spread with currants, sugar and spice before being rolled into a spiral. Careful placement of the buns on their baking tray, so that their sides touch as they expand in the oven, ensures their distinctive square shape. A final brush with sugar glaze while they're still hot makes them characteristically sticky. They were invented at the Chelsea Bun House, owned by the Hand family, at the start of the eighteenth century. Customers flocked to buy them - perhaps also attracted by the colonnaded Bun House's collection of clocks and curiosities - and even royalty are claimed to have been among the Bun House's clients. The treats were something of a Good Friday tradition, along with hot cross buns, with tens of thousand of customers apparently turning up on the day. Despite numerous local imitators, business thrived; it was boosted further by the opening of neighbouring Ranelagh Pleasure Gardens in the 1740s. 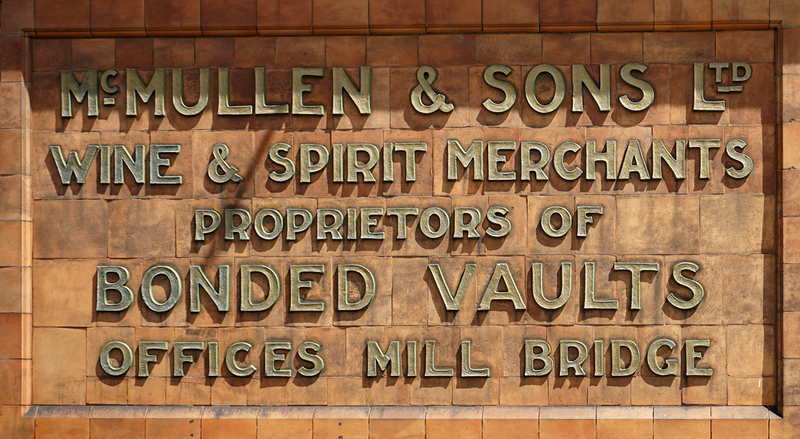 After the Gardens closed in 1804, custom fell but the bakery continued in business. The popularity of these buns, though, grew and they remain a popular bakery staple today. You'll even see variations, replacing the currants with other dried fruit, chocolate, marmalade, or nuts. They're delicious, and fun, to eat: it's almost impossible to resist uncoiling the spiral as you go. Just across the road from Harrods, a sign advertises a delicacy you won't find in its food halls: Montpelier Mineral Water. 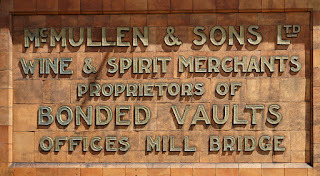 The sign seems to be almost the only trace of this company; but they did really exist, and several of their bottles survive. These are Codd bottles, encapsulating another piece of London history. 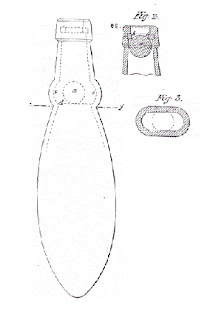 Victorian engineer Hiram Codd worked for the British & Foreign Cork Company; seeing the shortcomings of corks for carbonated drinks, he invented a new way of sealing bottles. His globe-stoppered bottle had a rubber washer and marble; the pressure of the drink held the marble against the washer, sealing it. To open the bottle, the marble was pushed inside; the bottle neck was shaped to stop it blocking the bottle again. To market his product, Codd drew upon the network of mineral water companies in the capital. 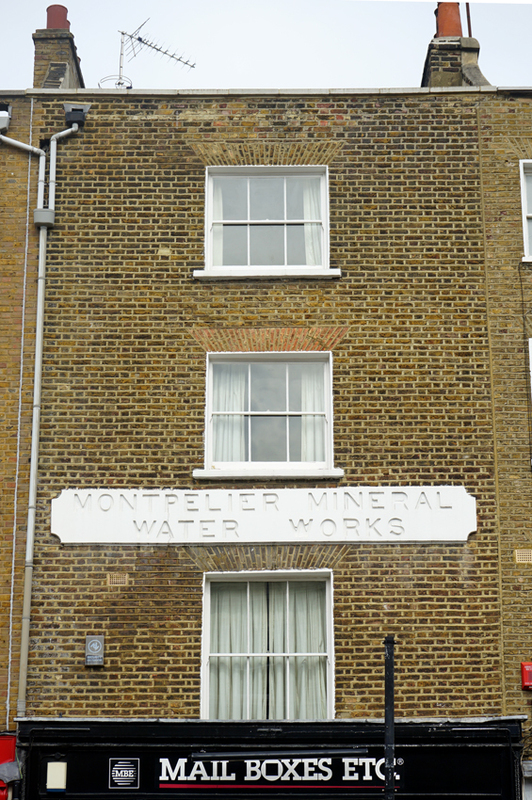 London may seem a surprising source of mineral water (an Only Fools and Horses episode comes to mind). However, the appalling quality of Thames water - and the more rural nature of many areas now wholly urban - made local mineral waters viable products. Their appeal also came from being carbonated, using methods invented in the late eighteenth century. 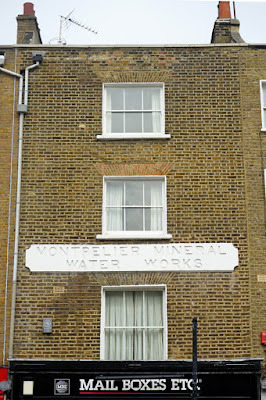 Thus Codd could experiment at a small works on the Caledonian Road, and take as partner the father of Camberwell's Malvern Mineral Water Co. The new product was a great success. Almost as soon as the bottle launched in 1873, Codd had issued 20 licences to mineral water soda companies; he had a further 50 applications. Factories in Kennington and Camberwell produced the glass marbles - a curse to later bottle collectors, because children would smash the glass to get at the marble. 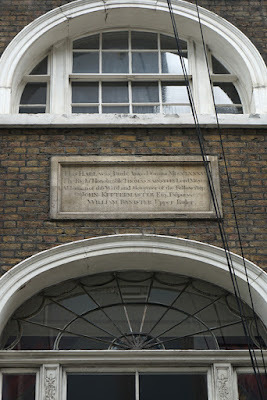 In 1885, Codd died; he is buried in Brompton Cemetery, close to this works which used his product. If Knightsbridge seems an unlikely place for a works of any kind (Bonhams auctioneers are across the road from the former Works), that was less true in the late nineteenth century. 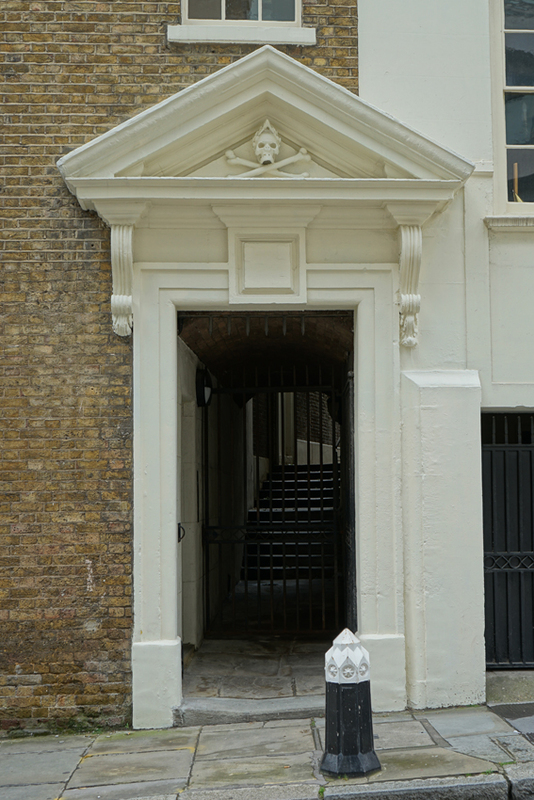 The Montpelier Estate, of which this street formed the eastern boundary, was neighboured by working-class dwellings; the street was noticeably less grand than the square it led into, and had a variety of shops. Even when the area moved more uniformly up-market after the First World War, the Estate's residents had to fight off Harrods' proposal to build a large bakery on Montpelier Street. Today, though, the sign serves as an incongruous reminder of a more industrial past.